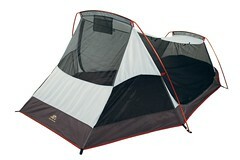 Saturday December 31st, 2011 was the REI Year-end Garage Sale in Eugene. This is a big sale at REI, where they sell slightly used gear, returns, and display items. This was the first time I have been able to go to one myself, and let me just say it was well worth the short wait in line to get in. There was a lot of great gear to pick up there and I got myself some presents that I’m quite happy about. This is the first real tent I have ever bought, but it seems like it will be perfect for me: 3 season, fits 2 people, pretty light at 5lb 2oz total, packs pretty small. I’m quite excited, the only thing is the tent was not cleaned up before packing away after the last use, so it smells like the outdoors (Angel claims it smells like mossy earth and radishes). No visible mildew, but I should clean it as soon as possible. If anyone has any ideas on how to clean it in the middle of winter, indoors let me know. The biggest problem right now is all the rain we’re getting, so I can’t set it up outside to clean it out and hang. So I’ll need to do this inside maybe in stages. If I can’t get it cleaned out well enough it’s no big loss, it was $9.83. 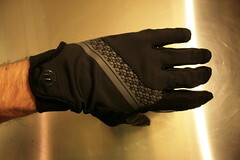 These gloves fit very well and should be a great cool and dry weather glove, when my Novara Stratos Bike Gloves are just too warm. 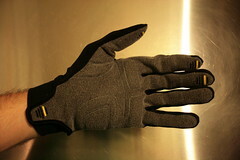 On the tag, the reason for return was “not warm enough”, but these will work well for me. They just needed a little stitching fix, and now they are perfect. I can’t wait to get to use them this coming spring. 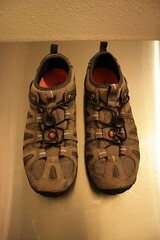 The shoes are hardly broken in and all the tread is there, including the fine tread that wears off fast. 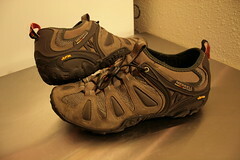 They should be great for hiking and walking. It was a big surprise for me to find this, and it was a hard decision to get it but I did. Angel and I shoot lots of videos together and we have always talked about getting one. This price was too fair to pass up. I can only imagine no one got it before me because: A. They didn’t know what it was, or B. They don’t do video editing themselves. The camera is in perfect condition. The reason for return was “didn’t like product”, and I don’t really know why they didn’t like it, but I like it already. It has HD video up to 1080p at 30fps, with 127º wide viewing angle. 60fps at 720p and WVGA resolutions allowing smooth slow motion playback with 170º wide viewing angle. With a waterproof case allowing it to go to depths of 180ft (60m), my Fuji XP10 depth is only 10ft (3m). 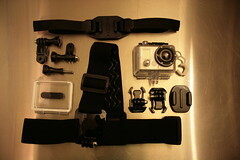 Comes with mounts, including a one for vented helmets. This should get a lot of good, fun video footage that we can use. Great for long bike rides, or trips to the coast. Can’t wait. I’m excited to get to use these new items and after I will write reviews for them, so stay tuned. 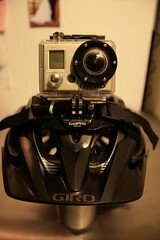 There will be new videos as well with the help of the GoPro Hero. This entry was posted in BIKE, Events, Reviews, Trips and tagged bicycle, bike, bike commute, bike tour, camera, eugene, GoPro, hike, Long Haul Trucker, Oregon, REI, review, video. Bookmark the permalink. Sounds like a lot of good stuff for yourself…what about Angel?? cool! that go pro is a great deal!